When we were exploring the emotional and spiritual depths of Scorpio in the Autumn, we were guided by the Light at the end of the tunnel, emitted by the Guardian of the Threshold, and by our Light within, the inner Source of Spirit. Sagittarius, the Guardian of the Threshold, brightens the deep purple of Scorpio into the healing lavender vibes. The depth of knowledge, gained through experience, is enlightened by the Spirit Light. The constellation of the Archer offers humanity the gift of the sounds K (as in “key”) and G (as in “guardian”). The consonant K, with its sharp gesture and the carmine and vermilion red hues, helps us cut away all that is no longer of service. The consonant G parts the veils so that we can step into the Light with humility. The process of letting go of what is no longer needed and acknowledging the Spirit within us happens during the Advent time—four weeks before Christmas—or rather, during the Sun’s annual visit with the Archer from November 21 through December 21. The journey from deep purple to lavender then repeats every month, assisted by the waning and waxing of the Moon, which bathes the Earth with the transformative violet rays. The celestial being of Luna gives humanity the double vowel of Ai (pronounced “ah-ee”). In the English language, the pronoun “I” is pronounced as “ah-ee”. Each time we say “I”, we draw on the metamorphic powers of Luna. But we have to make a choice. We can focus on the bright side of the Moon, that is, on the lighter shade of violet that leads to soothing lavender. Or we can get stuck on the dark side of the Moon, and sink deeper and deeper into darkness of dark purple, abandoning the Light and get lost in the shadows. The choice is ours. Will we lift the energies of the Earth to the next level, closer to the Spirit world? Or will we annihilate existence with hectic lifestyles devoid of Light and Love? What do you choose? Each Monday, the day of the Moon, we are offered the opportunity anew. Will we strive to imbue the workweek with Love, or will we yet again be a victim of tight schedules, filled with worries and anxieties? The Sun chooses the Light and continues its annual journey into the Capricorn to be born afresh on the Winter Solstice. In exoteric astrology, Capricorn is an earth sign that grounds us in practical matters. 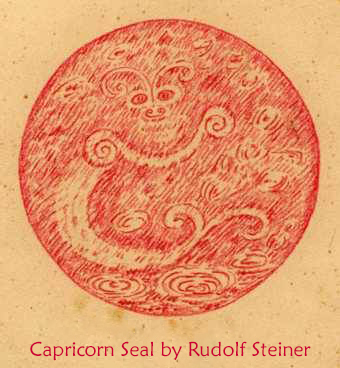 Through the eyes of esoteric astrology and eurythmy, we see that the constellation of the Goat provides a protective shell, awash with soft pink, where we can commune with our Soul. The peach blossom color or soft pink is the most spiritual of all colors: the union of pure white of Spirit with a touch of Red of Life. The stars of Capricorn pour the sound of L onto the Earth. 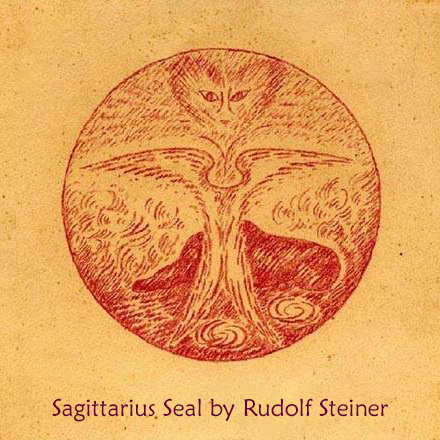 According to Rudolf Steiner’s spiritual research, the sound L is the only water sound. 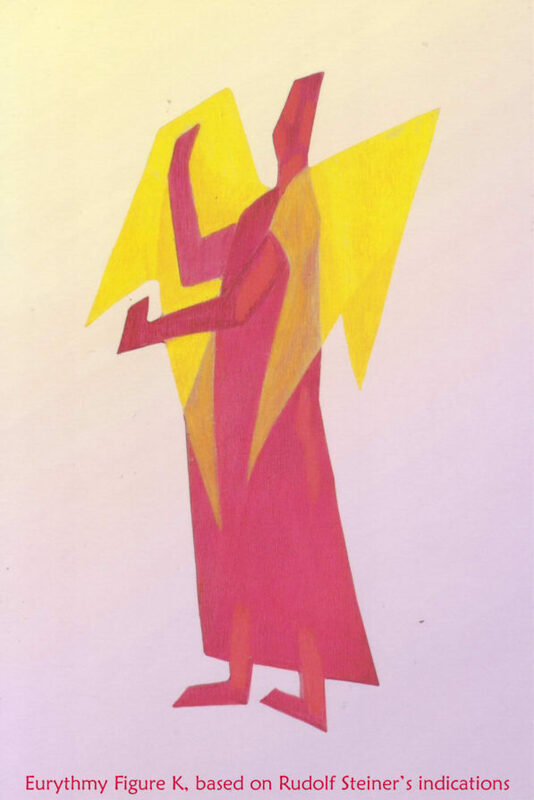 In the harmonious movement art of eurythmy, the L gesture is a continuous renewal of the Life energy. Like a fountain. The arms reach deep down to lift the energies up the body in front through the chakras all the way up, as far as the arms can reach, and then down again on the sides. 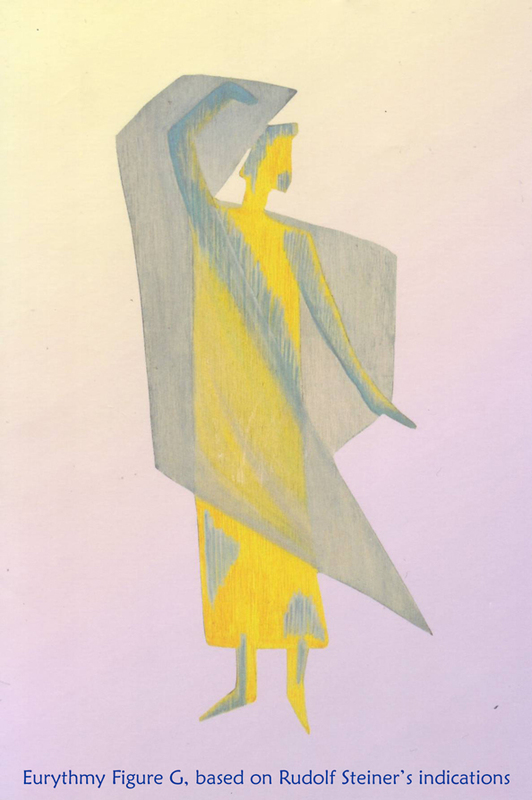 The eurythmy figure for L is clad in silver grey, with seven orange or golden yellow arcs going up from the feet to the top of the head, and the veil or movement vibrates violet/purple/lavender hues. We transform our physical bodies by moving the Light of Spirit through our energy fields. 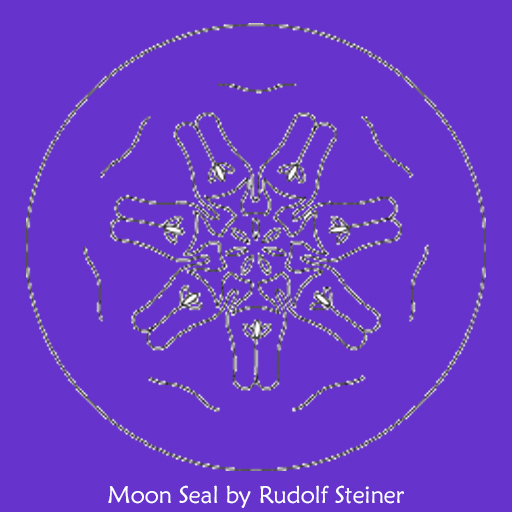 You may want to learn the chakra cleansing exercise to the sounds of Halleluiah with lots of Ls, given by the European esoteric teacher Dr. Rudolf Steiner. If you are in New York City or close by, come to my eurythmy circles; I’ll be teaching this exercise throughout the month of January. For more info visit http://www.hamoves.net/eurythmy-circles-nyc/. Or connect with your local eurythmist: Contact the closest Waldorf school (they are all over the world) and ask for their eurythmy teacher. If you have hard time finding one, send me a note and I’ll assist you. As the Sun rests in the embrace of the protective shield of Capricorn from December 21 through January 20, we too are invited to enter the safe haven of our Soul to cleanse the inner chambers, to nourish our Source of Light and Love within. It’s time to slow down, and get into the flow of spiritual practice of your choice. To create a spiritual routine that suits you and your specific needs. There are lots of different options available. Explore what works for you. For some, an already established spiritual modality may be good. For others, it may feel better to put together your unique mosaic, assembled from the insights of various spiritual approaches. The key is to step into your own column of Light and connect closely with your Highest Self. You may get some help from other people, but remember that you know yourself the best. The Halleluiah harmonious movement meditation is an exercise that actively purifies your chakras, and more. Eurythmy works with chi energy, which gets lost in recordings. I highly recommend that you first learn this movement sequence with a trained eurythmist in person. Then later, you can get a video recording or written instructions as a reminder. But don’t attempt to learn the exercise from a video recording or written instructions that may be available online. If you already know the Halleluiah exercise let me know and I’ll email you my own verse for free to enhance your practice, and to explore further. 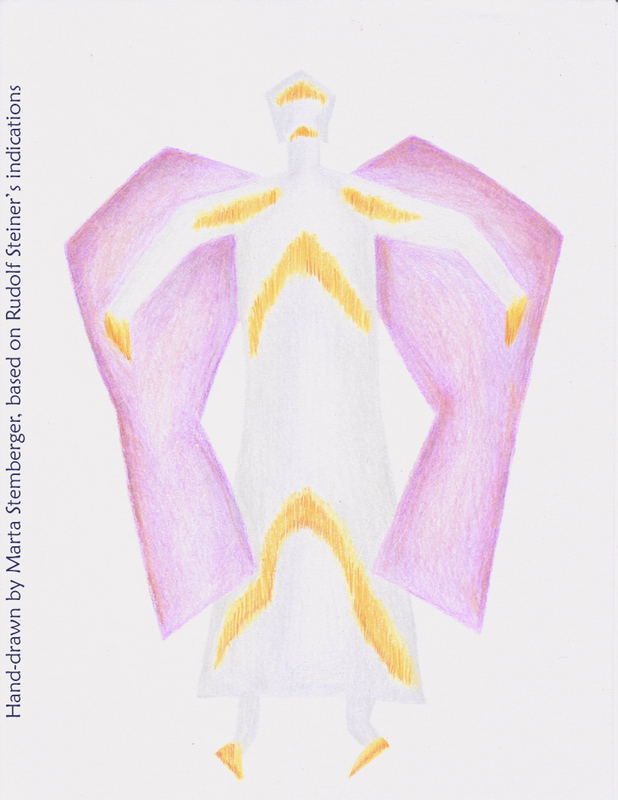 Artistic interpretation of the Halleluiah harmonious movement meditation by the eurythmist Gail Langstroth, my very first eurythmy teacher.